If you are a new business or a contractor, you want to choose a dumpster size that is correct for your business or job. If you choose one that is too large, you’ve wasted profits and if you choose one too small, it won’t accommodate all of your materials. Learn about the sizes to make the right choice. Learning about the different sizes of dumpsters and what they will hold can help you to determine which size best fits your needs. Whether you have a commercial business, you are a general contractor, or a homeowner that wants to clean out the basement, this guide will help you to make an informed decision. What Does the Amount of Yards Mean? Dumpsters are sized by the yards, such as 12, 15 and 20 yards. This is not a measurement of the length of the dumpster, by any means. To realize just how much debris will fit in one dumpster of any size, you need to understand the math behind it. The measurements of dumpsters are in cubic yards as a measurement of the volume it will hold. One cubic yard is 3 feet by 3 feet by 3 feet, giving you 27 cubic yards that will fit in it. If you multiply 27 cubic yards by the dumpster size, it will give you the total amount that you can fit in it. For example, a 12 foot dumpster holds 12 times 27 or 324 cubic yards. Many people find it quite handy to determine what size dumpster they need by estimating how many truck loads in a regular full size truck bed would fit in it. A standard full size pickup bed is 4 feet wide by 8 feet long plus a few inches in both directions. It is made to be able to carry sheets of plywood with the tailgate closed. You can estimate that about 3 truck loads will fit in a 10 yard dumpster, 6 truck loads in a 20 yard dumpster and about 9 truck loads in a 30 yard dumpster. Therefore, if you are determining the dumpster size you need by how many truck loads, multiply your estimated truck loads by 3 for each 10 cubic yards of a dumpster. Most of the same types of construction or homeowner jobs will require a certain size of dumpster to accommodate all of the refuse materials. 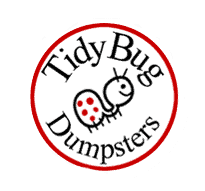 A 12 yard dumpster is for the small jobs, such as a garage cleanout, a basement cleanout, a general household cleanout, an attic cleanout, dirt or concrete removals and interior renovations to a home or business. A 15 yard dumpster is for jobs that require a bit more space for the debris, such as a deck removal, a floor removal, bedroom remodel jobs, roofing jobs, large landscaping jobs and dirt or concrete removals. A 20 yard dumpster works well for larger deck removals and pool removals, new home construction, interior renovations, clean out of an entire home and small home demolitions. Most of the same types of businesses have about the same amount of garbage, unless you happen to have a huge restaurant and are comparing it to a fast food chain. A 2 yard dumpster is usually all that is needed for small retail shops, small restaurants and other small commercial businesses. It holds approximately 24 trash bags. A 4 yard dumpster is most often used for gas stations with a lot of traffic, large retail stores and small apartment complexes or duplexes and it can hold 48 standard garbage bags. A 6 yard dumpster is most often used in multi-family housing and it will hold 72 regular garbage bags. An 8 yard dumpster is often used in large apartment complexes with a capacity of 96 garbage bags. The 10 yard dumpster is most often used for large warehouses and manufacturers as it can hold up to 5 tons of waste. Your dumpster pricing will not only change by getting a larger dumpster and being a bit more money, but it also depends on the frequency of pick up that you will need. So, getting a smaller dumpster than what your business needs will not necessarily be the best choice if it will need to be picked up several times a week. In some instances, you may need a contract for your dumpster service that can last for several years. If you are a business owner, a contract is a good idea so you can lock your price in. It’s best to check with local commercial dumpster companies to find one that fits all of your disposal needs. A smaller company is often a better fit and you will likely get more personalized customer service from someone local. Some areas require commercial dumpsters to be in specific areas on a property, such as the back of a building. Other areas may require a fence to be placed around a commercial dumpster for safety purposes. You should check with your local government to learn about commercial dumpster laws. You can determine what size dumpster size you need based on several different factors, so choose the one that you can estimate best. It can be by the truck load, the business or the job. These estimates should help you to make an informed decision on your dumpster size.